Jasco wood windows are produced from the finest quality kiln dried select Western Pine, provide superb insulating qualities and are treated with a water repellent preservative. Our wood windows are also available in Oak, Cherry and Mahogany. Customize the look of our windows with unique hardware, trim, paint colors and stains to match the style of your home. Both sash move up and down and many Jasco double-hung windows also have both sash tilt in for easy cleaning from inside your home. The bottom sash moves up and down in this type of window, allowing for a more economical version of the popular double-hung window. A casement window is hinged on one side to allow the window to swing out. They offer convenient folding handles to prevent interference with window coverings. An awning window is hinged at the top and swings out to provide ventilation while keeping out the elements. Hopper windows are hinged at the bottom and open inward. Frequently used in basements, these economical windows bring ventilation and light to your rooms. Jasco bay windows offer angular interest with either casement or double-hung windows angled around a center picture window to bring in light and ventilation. Jasco bow windows offer casement windows elegantly angled for the ultimate design and style option. 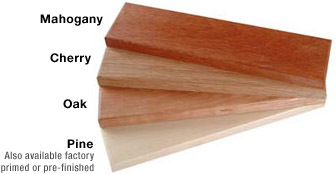 Our wood windows are available in Mahogany, Cherry, Oak and Pine. Pine windows are also available factory primed or pre-finished if desired. To get a quote or more information about Wood Windows, especially for homeowners and contractors in the Long Island, NY area, please contact us or use the easy form in the right column. We look forward to helping you turn your project plans into a reality.